One of these was given to me for free by Google in 2010. A CR-48 chromebook. It served me well in high school and the first year of college. However, they have a hinge problem. Mine was being held together by three machine screws through a hinge. Although I had Ubuntu 13.10 installed and working, I still almost never used this laptop. When I got a newer chromebook, I decided I had to do something with the old one, so I did. My plan was simple: remove the hinges completely and turn the screen around, then hang it on the wall to use as a digital picture frame. Even though digital picture frames seem very 2005, my roommates liked the idea enough that I decided to go through with it. The CR48 is actually fairly easy to disassemble. There is a great guide on the CR48 wiki. Once I had it open I removed the hinges and unplugged the fan. Then it was a simple matter of turning the screen the other way. I needed some way to tape the screen to the back of the laptop, so I gathered up my adhesive supplies. Luckily I discovered some velcro strips! These were exactly what I was looking for. Now I had to figure out a way to hang this whole assembly on the wall. I looked through my dollar store picture hanging kit and pulled out some picture hanging wire. Then I tied it through the speaker holes on either side of the CR48. When I tried to turn it on I discovered a problem. The computer goes to sleep when the lid is in hanging configuration because of a magnet in the lid. So I pulled the magnet out. I knew the whole time that I wanted anyone to be able to add pictures. The easiest way to do this was by email. For awhile I figured I would set up some sort of POP3 email server with a script to put them on the laptop, but it's even easier than that. I used Dropbox and Send to Dropbox to give my Dropbox account a special folder with its own email. 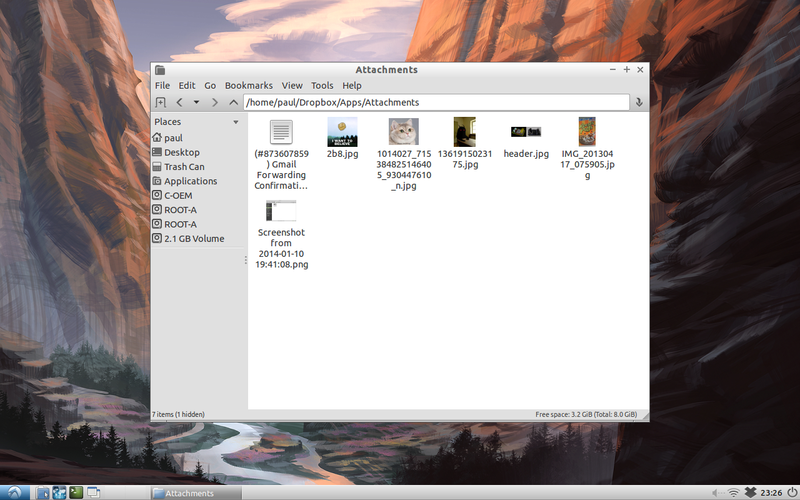 Then I installed Dropbox on the picture frame and used selective sync to only sync the special folder. Send to Dropbox is a nice free service, but it gives an ugly email. Instead of using that, I set up another gmail account for my domain and forwarded all the email to Send to Dropbox. Then I tested this out with a few pictures. 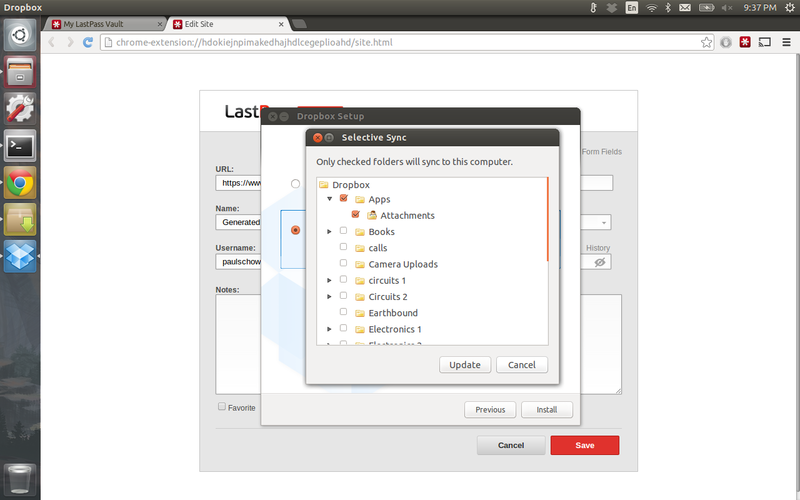 After looking through the Ubuntu software center and trying about 10 programs, I was ready to give up. 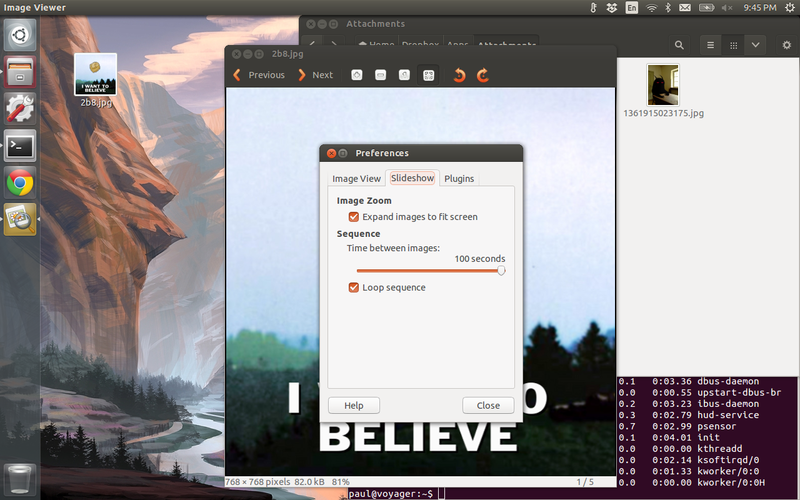 However, I discovered a plugin package for the default image viewer, Eye of Gnome (eog). Eog can already fullscreen all pictures and play animated gifs, but it lacks random slideshow order. The package eog-plugins gives it random slideshow order. Now pictures are sent to the email, added to Dropbox, and put in the random slideshow to be shown eventually. In this state, I hung the picture frame up on a wall in my living room for about three weeks. I put the email address up on Facebook and on a note next to the frame. It worked and I quickly reached over 200 pictures in the slideshow! I was not done yet. Now I went back to the dollar store and picked up a picture frame and some black construction paper to make it look a little better. One of the best features is animated gif support. I created a gif of a gif on the picture frame to show this. To put the frame to sleep, I simply put a large hard drive magnet next to the right side of the frame and leave it there. To shut it down, I ssh in and turn it off.